T. J. Holmes Company, Inc. 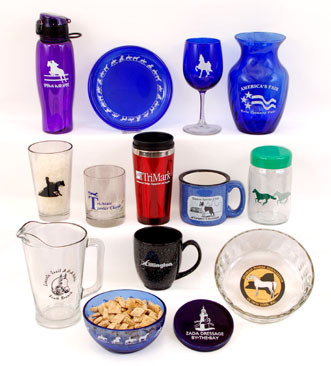 Call on us when you need Custom Imprinted Glassware, Ceramic, Stainless Steel or Plastic Items for your Organization or for a Special Event. We can print your Logo, Type of Award, Event Name and Date, or other information on the item of your choice. We have Stock Items which are available in various Designs for use as awards or trophies where quantities do not warrant creating a Custom Imprinted item. These items do not incur a screen or set up charge because they are standard designs. Many of these items make excellent gifts as well as awards. Copyright A 2008 T. J. Holmes Co., Inc.--All rights reserved.